this weekend i will be heading up north for the last wedding of the year. a muskoka cottage wedding taking place in port carling. BUT before i leave, i want to leave you with these cupcakes! i think it is safe to say the cupcake trend is over-ish. i don't know, i certainly don't see a zillion cupcake shops anymore, cupcake wedding "cakes" (i hate them. sorry, not sorry.) or food network shows based on cupcake making wars. though, cupcakes will always be one of my favourite variations on cake! you can't beat the frosted swirl, the ratio of cake to frosting or the all around cuteness of a cupcake. these ones are inspired by.. you guessed it.. the colours of FALL. 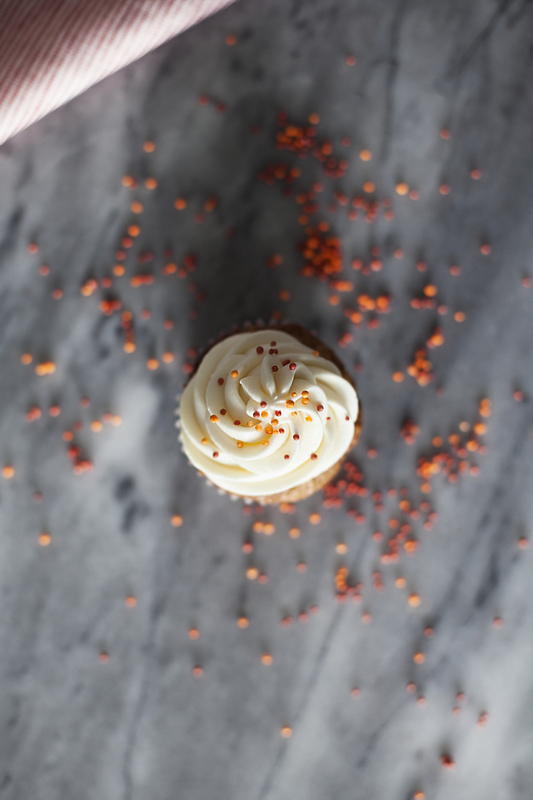 red & orange sprinkles to compliment apple & carrot filling. 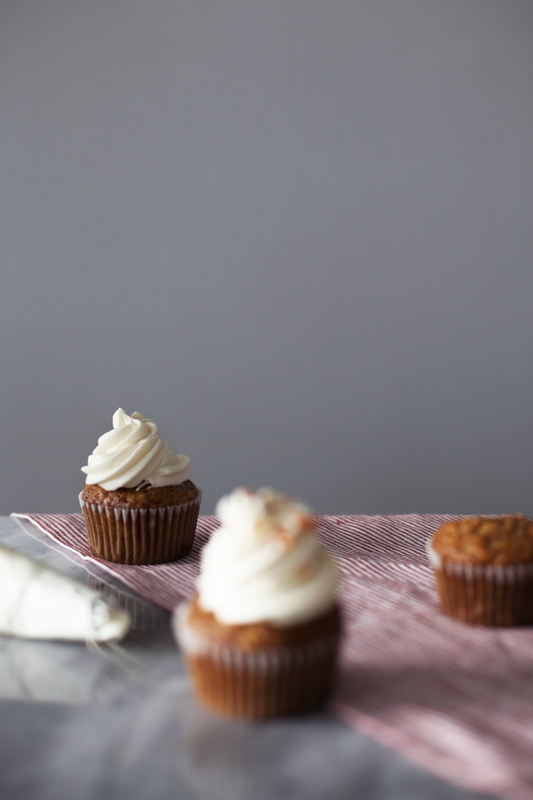 the cupcake is light, moist & topped with a super creamy cream cheese frosting. while i usually make frosting on the sweeter side, i kept this frosting a bit tangy. now i can pretend it is a breakfast cupcake! 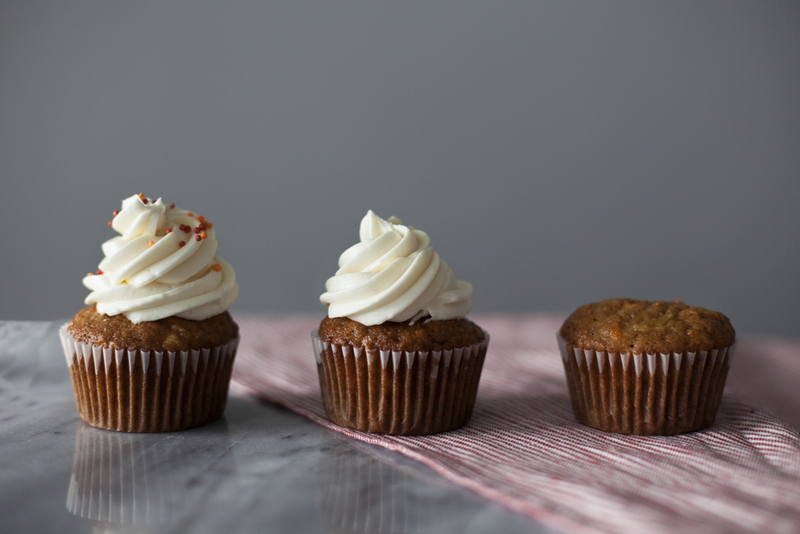 just an apple & carrot muffin topped with some cream cheese, you with me?! in a bowl sift flour, salt, baking soda, cinnamon & nutmeg. in a separate bowl beat sugar, oil, eggs and vanilla until light & fluffy. fold in grated carrots & apples. stir in dry ingredients until just combined, do not over mix. divide evenly amongst 12 lined cupcake tins & bake for 15-20 minutes, or until golden brown on top. 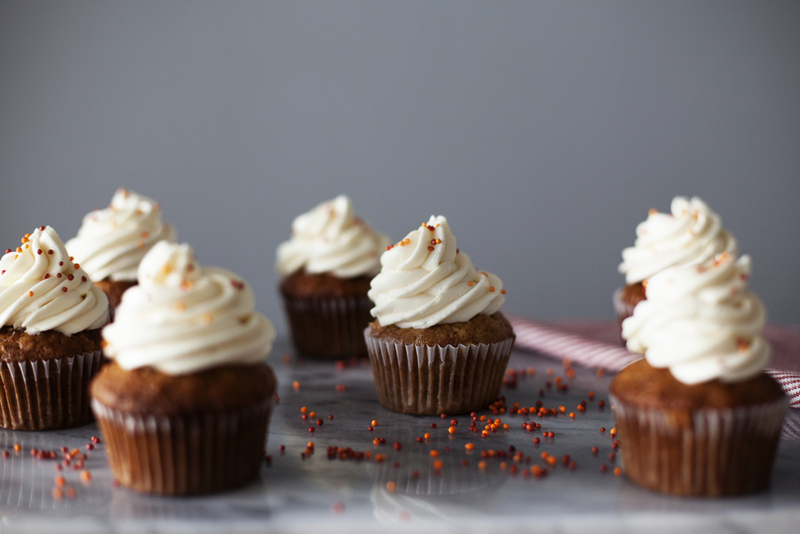 let cupcakes cool while you make your frosting. for frosting: beat butter, sugar and vanilla on high until light & fluffy (about 8-10 minutes). throw in cream cheese one tablespoon at a time until it is JUST evenly combined. the frosting should remain fluffy. if you over mix it will turn runny. pipe or frost cupcakes as desired. finish off with sprinkles!